Dating apps can be exhausting. Often it means swiping through an endless array of possibilities who may never respond to your messages or are only looking for a quick hook-up. If you’re looking for a real, meaningful relationship and a chance at lasting love, using a dating app can feel pretty useless. But it does work. In fact, eHarmony reports that 20% of current, committed relationships began online in 2015 and that number has been rising steadily every year. Even more noteworthy, research suggests that relationships that started online are happier than those that started with an in-real-life first meeting. There are literally hundreds of apps to choose from out there — so many that even deciding what to download for your best chance at a happily-ever-after can feel overwhelming. The truth is just about any dating app can lead to a real, satisfying relationship with enough effort and the right profile, but here are 15 stand-outs for finding a real relationship. Match.com has been there since the beginning and successfully made the jump from website to app, using the same strategies that have led many to finding love on the world wide web in a more convenient user interface on your phone. Match is a great way to find lasting love because it’s membership model, $42.99 per month (or if you’re willing to commit for three months, $23.99 per month). This means there’s less chance of users browsing the app for a quick, no strings attached hook-up. Personalized matches are sent to you each day, which means you don’t have to do as much legwork swiping and hunting. Plus, they offer more complete photos and profiles. The one con to Match is that many perceive it as a bit dusty and old-fashioned because it’s been around for so long– so if you’re looking for a young, hip, trendy partner, you probably won’t find them here. Match has such a storied track record and history of bringing people together for lasting love, they run a website called “Success @ Match” dedicated solely to the testimonials of users who found their special someone on Match. You can browse the thousands of stories there if you need some romantic inspiration. Many apps today are based on surface-level connections. Let’s face it when you’re swiping through hundreds of profiles, seeing someone you find physically attractive is likely to catch your eye. But so much of what makes relationships work is compatibility — something Elite Singles is dedicated to. You won’t find any casual hook-up seekers here because participating requires filling out an in-depth personality questionnaire that takes the average user 45 minutes to complete. The questionnaire is based on leading theories in relationship science and technology, purposely designed to determine actual compatibility beyond surface-level connections. After the comprehensive personality test is done, it syncs up with matches in your area and sends you 7-10 matches a day, also reducing the pool of people you interact with each day, further emphasizing the app’s focus on commitment. The name says it all — more mature, high-level, professional singles (82% of members are university graduates) are the target audience for this app, which feeds into its higher potential for finding a lasting connection. The app is also a good bet for men. Most dating apps skew heavily to a higher ratio of male users, but a 2017 report found Elite Singles is 56% women and 44% men. It’s a growing pool too — one source reported that Elite Singles was seeing 65,000 new members per week last year. Coffee Meets Bagel is ideal for someone who wants the speedy, photo-heavy interface of Tinder with a more curated experience. It’s a great app for someone patiently waiting for that one special someone since you are only granted a limited list of matches (or “Bagels”) per day. It might seem counterintuitive to apply the minimal profile of an app like Tinder (there are boxes for hobbies, photos, occupation, etc. but there’s no room for an essay) to a highly curated dating experience. However, according to James Anderson, dating expert at Beyond Ages, having fewer options is better if you’re looking for a lasting relationship. “Many dating apps and dating sites are essentially a numbers game,” he told Ask Men. “You look through hundreds of profiles, message dozens of people, and maybe get a few dates. With Coffee Meets Bagel things are very different… Each person actually takes the time to review the match instead of making a decision in two seconds based on the photo.” Lasting love and Coffee Meets Bagel go together like, well, coffee and bagels. “Tinder for feminists”, Bumble levels the playing field in a way that makes a genuine connection more probable. Many women complain that dating apps prevent them from separating out the worthwhile guys from the creeps because their inbox is inundated with messages, many of them too aggressive. Since Bumble requires women to reach out first once a match is made, it helps balance out power dynamics and prevent women from feeling burnt out or overwhelmed by their inbox. The interface here is very similar to Tinder, so make sure your profile outlines that you’re looking for a real relationship and nothing casual to avoid any disappointments off the bat. For women making the first move, avoid cringey pick-up lines and instead approach it like a job interview with a warm hello, casually informed comment, or if you’re feeling very bold — a proposed date. Women have 24 hours to reach out to a match, meaning there’s a sense of immediacy to finding that special someone. Since women make the first move, men can feel more confident in moving the conversation to an IRL setting, knowing that they won’t be making an unwelcome advance. Even better, given that the app’s founder says 60% of matches result in conversations. If you have extremely high standards, The League might be just the place for you. The app is fairly exclusive with a lengthy waiting list to join (and qualifiers include level of education, occupation, etc. because the app connects to your LinkedIn profile). Anyone using it most likely is taking things seriously if they’ve jumped through the hoops necessary to join. The League offers 3 potential matches a day based on proximity and desired age range. They’re also serious about keeping any casual hook-up seekers off the app, closing down accounts of those who don’t sign on or respond to messages regularly. Furthermore, The League often hosts events in major cities, so if you’re looking to meet someone in person as opposed to online, the app can help with that too. Subscription: Once accepted, it’s free. You can become a member at different tiers starting at $4.99/month for extra prospects and more. OkCupid launched on the principles of Myers-Briggs personality tests and the site is rife with questions and quizzes for you to fill out, so that you find precisely the one for you — want someone who is liberal, hates mushrooms, loves Mumford and Sons, and hates rom-coms? You can get that. Your responses combine to create a match percentage with potential dates, allowing you to determine what percent compatible you might be with another person based on both of your answers. If finding a person who is like-minded and shares the exact same tastes and interests is integral to your happiness, OkCupid could just be the app for you. Though it has membership tiers, it also markets itself as the “best free dating site on Earth,” a fact which means it has a lot of users — and if you want a big pool to hunt through, you can’t get much bigger than this. OkCupid also logs their success stories if you want to see the proof in the pudding. If you believe that quality is better than quantity when it comes to the search for love, Once reduces your options to one match a day (just like the name suggests). What makes this different than say Coffee Meets Bagel that also limits matches? Your matches are chosen by actual humans rather than simply a digital algorithm. The team of matchmakers chooses a match from active users. Do you like the user interface of an app like Tinder or Bumble where profiles are brief and picture-heavy? But maybe you don’t like the random swiping or struggle to find a way to start a conversation. If you want to build a relationship based on a genuine connection, Hinge is a great place to start because it requires you start from a place of specificity. Users fill out a profile, choosing from questions and prompts — and to make a match, you must comment on a single image or piece of biographical information rather than mindlessly swiping right. It means you’re spending more time thinking about whether this person is a good match for you and what your shared interests might be. What’s more — the app uses Facebook to connect you to friends of friends, already starting from a place of mutual interests and friend groups. Inner Circle combines the selectivity of some apps with the more casual social aspects of others by running exclusive member-only events on a monthly basis. Inner Circle ensures through their swanky monthly events that you have equal opportunities to meet a potential date online or at a special event in person. The selectivity feature here is a fantastic way to ensure you’re looking for someone who wants something real — those deemed to be suspicious or trashy in any way don’t make it through the vetting process, helping you forge a genuine connection while feeling like a member of an exclusive club together. What’s more, the app tries to curate members with similar backgrounds and interests to ratchet up the compatibility factor. The app began in Europe in 2013 but has been steadily expanding worldwide, meaning it’s also not overrun with people like some of the older apps. Do you feel like you’re better in person? Or you want to meet someone while doing a shared favorite activity? “How About We” is the perfect dating app for those who can’t stand online banter that never goes anywhere, no matter how promising the match might seem. Users simply post a favorite date or desired date in their area, whether that’s grabbing coffee on the street corner or roaming an art museum, and interested parties can select a date they want to go on — the app does the legwork for you, ensuring you’re more likely to meet someone and feel your chemistry in person than sussing them out online while you try to discern if they’re serious about a relationship. Find love out there in the world with this app (or maybe even a friend who just shares your social interests)! 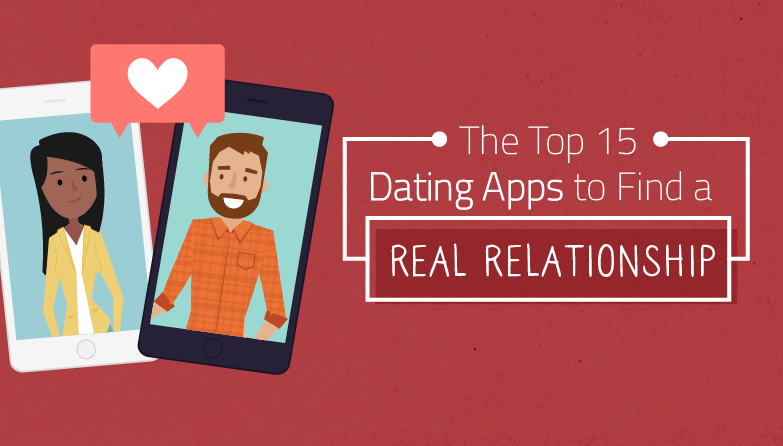 Ok, yes, we know, we’ve spent a lot of time comparing other apps here to Tinder, explaining why they’re better — but the truth is, so long as you’re open about what you’re looking for and lead with that conversation, you can find a lasting connection. Yet, we can’t deny that it does provide you with a seemingly endless array of options no matter where you are in the world — your odds can’t possibly get any better than that. Just make it clear in your bio and be transparent in early conversations that you are looking for something serious. As Tinder becomes the most popular dating app amongst millennials, it’s increasingly home to people looking for something more. The best part is that Tinder is responsible for 1 milion dates per week. So, a particular benefit is that it’s always easy to find the next option if you don’t click on your first try. Subscription: Free but can upgrade to Tinder Plus for $9.99/month for bonus features like unlimited likes. Have you ever been on a subway train or walking through a park and thought, “Man, that person is attractive. I wish I could go up and introduce myself. Maybe they’re the one!” Happn is predicated on making this fantasy a reality by only showing you potential matches you’ve crossed paths with in real life. If they take the same commuter train, the app even records how many times you’ve crossed paths (users have to come within a 250 meter radius of your phone). It’s no guarantee of compatibility, but at least it’s a way to help you find the person you felt a spark with across a crowded room. Sometimes that chemistry is the most potent and long-lasting. A major sticking point in relationships can often be distance, particularly in big cities — so match with someone frequenting the same restaurants and cafes that you are to help find domestic bliss. Have you been hoping your bestie might set you up with the man or woman of your dreams? Now there’s an app for that. Wingman puts your dating life in your friend’s hands, allowing your bestie to create an account for you and do the swiping to find matches — once a match is found, it connects you directly with the person to see if you want to take the conversation further. If you’re looking for something a bit untraditional to help you find love, this just might be it. After all, so often our friends know us better than we know ourselves — so, having them write our bios and handpick our matches is one way to shake things up a bit. Plus, so often, we turn to friends as we craft accounts or decide to have second dates anyway — this just includes them more directly in the experience. The effort involved in getting your bestie to participate probably means the crowd on this app will be looking for more serious relationships than casual hookups — and then they can take all the credit in their toast at your wedding. There are a thousand and one ways to determine your potential compatibility with someone — algorithms, simple swiping, and more. But if you’re really at a loss for how to find that perfect match consider an ancient method — astrology. You may scoff at the idea of finding your partner by asking “What’s Your Sign?” but Align turns that query into literal match-making, using your zodiac sign to help find good matches based on astrological compatibility. It may sound silly (and the app is fairly new, so it’s hard to determine its track record), but it certainly can create compatibility matches for those who believe in it. Plus, it allows you to build your profile with sign-specific traits and emoji. If you’re LGBTQ, sometimes dating apps like Tinder or OkCupid might feel less than ideal. Her is more like social media than a dating app in that it allows users to create profiles similar to Facebook and connect with people via that platform. Additionally, the app regularly promotes queer events in users’ areas to help individuals find LGBTQ friendly spaces where they could meet potential dates in real life. The app was devised originally for lesbian women, but it has become a home for any cis-gender women or non-binary individuals looking to date queer women, providing a rare trans-friendly app. Created by and for queer women, it caters to things your run-of-the-mill all-encompassing apps might miss.